Ok a cucumber season already passed but I've bought about 10 cucumbers at a market. The true is that this type of salad is great during summer when it's really hot outside and you don't feel like eating anything warm. 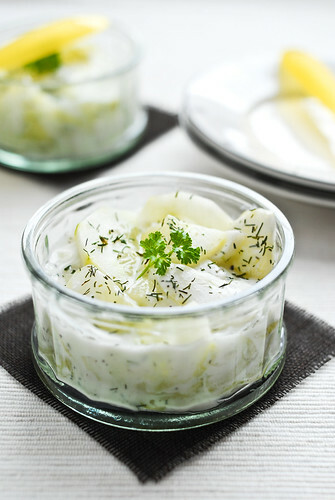 But I can eat cucumber salad during all year because it's so versatile in use. It will work as a perfect side dish with barbecue or like a light lunch when served with a crunchy baguette. Another great thing about this salad is, that it is so easy to make! I've used a white yogurt but it's very tasty with soured cream as well. If you like garlic and you don't need to worry about our breath in the morning don't hesitate to add some. 1 Put the cucumber in a colander over a large bowl, sprinkle with the salt, mix well and leave for 20 minutes. Discard all released water. This way the cucumber will stay crunchy and the dressing won't taste diluted. 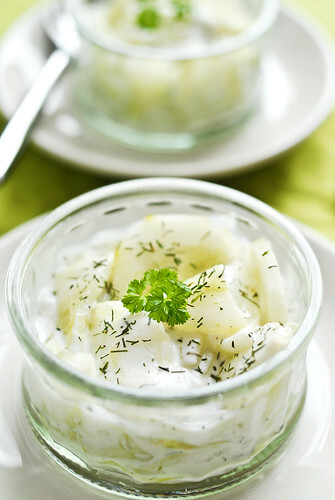 2 Put the drained cucumber in a bowl, add yogurt or soured cream and dill, then season with salt and pepper.